Storytelling is one of the oldest artforms, whether it's retelling an even that happened in the past, perhaps a childhood memory or an anecdote, or reading a bedtime story or watching a plot unfold on TV, storytelling is part of everyday life. National Storytelling week starts on the 31st January this year and schools, libraries, Scout groups, Brownies, hospitals and lots of other institutions and organisations will be taking part, organising storytelling events, famous author and laureate visits, as well as bookshop events, such as book clubs and coffee mornings. Many schools and nursery schools get the kids involved by letting them dress up as their favourite character from a book as well as encouraging them to bring their favourite book from home to show to the class, or for the older kids, holding workshops where they can write their own fairy tales or graphic novels. To celebrate National Storytelling Week, we're giving a MeReader away to one lucky winner. MeReaders are a new electronic reading system from the makers of Story Reader 2.0. 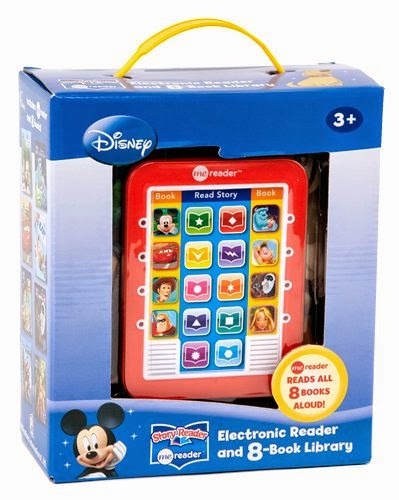 The Me Reader is a 4½ x 6-inch electronic pad that reads out loud each of eight Disney storybooks. The reading pad is compatible only with the storybooks included in the set. The Me Reader system is recommended for children ages 3 years and older. The device is simple to work. To begin, children select one of the eight storybook buttons on the Me Reader, which is made of sturdy hard plastic. Next, they find the storybook they have selected, open to the first page of the story, and press a “Read Story” button on the pad to activate the narrator’s voice. Each time they turn a page, children again press a “Read Story” button to continue hearing the story. Kids know which “Read Story” button to press by matching those on the pad with those in the storybook. To enter our competition simply enter the MeReader competition we're hosting on our facebook page. The competition ends at 12pm on the 6th February. For more books, e-readers and journals for all ages head over to 24studio today.